Learn how you can easily convert multiple PDF files to fully editable Apple Pages, Keynote & Number formats on the Mac using PDF2Office for iWork 2017. PDF2Office for iWork 2017 is the latest Mac app to convert PDF files to fully formatted Apple Pages, Keynote and Numbers documents and supports the latest macOS technologies. 1. You simply add PDF files 2. Specify the type to convert to (Apple Pages, Keynote or Numbers) 3. Finally click Convert. All documents are fully editable in Pages, Keynote and Numbers on the Mac. Thank you for joining us today. We wanted to take our time and introduce you to how you can convert PDF files into Apple Pages, Keynote and Numbers files using PDF2Office for iWork 2017. So, PDF2Office for iWork 2017 is a Mac application that converts PDFs to fully editable Apple Pages, Keynote and Numbers files. The 2017 release of PDF2Office for iWork was built from the ground-up offering many exciting features and making it even simpler to convert your PDF to Pages, Keynote or Numbers format. So here we see the PDF2Office for iWork window. You’ll notice immediately how modern and simple the interface is. You can actually preview and navigate PDFs in the application; but lets start converting PDF files to the Apple iWork formats. 1. So what we want to do is drag a bunch of PDF files from the Desktop (or from wherever) into the Conversion list. 2. 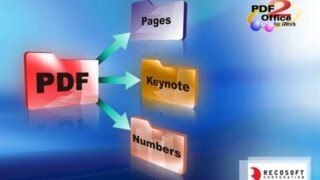 We then specify the kind to convert each PDF file to using the Conversion Format pop-up. So lets set the first file to Convert to Pages; the 2nd file to Convert to Keynote and the third file to convert to Numbers. 3. Finally, we just click the Convert button and we specify where to save the converted files; lets just set this to the desktop and the files start getting converted. Notice how PDF2Office for iWork 2017 converts multiple (batch converting) PDF files to Pages, Keynote and Numbers format at once! Wow that is fast. Lets just compare the converted output with the original. You’ll notice that all of the elements are in place, with proper text frames formed and even all graphics appearing intact in Pages. Then lets see how the PDF converted to Numbers and Keynote type. Again the conversion was just fantastic. 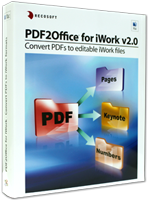 So PDF2Office for iWork 2017 from Recosoft easily allows anyone to convert their PDF files to editable Keynote, Numbers and Pages formats while retaining formatting accuracy and layout integrity. PDF2Office for iWork 2017 is available from the Mac App store.